Working on a college campus, as I did, can be a strange thing. Half the staff are single-minded about their jobs and the other half are recent graduates trying to stave off adulthood. Just as comic book culture was becoming pop culture, it still seemed weird to see superhero action figures on people’s desks. One co-worker kept collected volumes of comic book issues on a shelf behind his desk. These had been imported from the U.K. and printed in black and white. I asked what they were and left with a volume of something called Swamp Thing. For a little while, it was fun to go to science fiction conventions, meet some authors, buy something strange, and find people with similar interests. We made some friends, one of whom ran a comic book shop. On a later visit, we received a tour, during which I mentioned that I had read this comic called Swamp Thing. I confessed to liking it. The shop owner walked around grabbing items off the shelves and building me a small pile of issues that I really needed to check out. 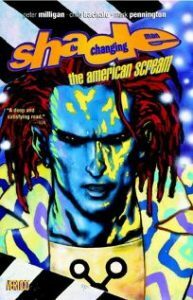 I had never seen Shade, the Changing Man, in his original incarnation, but the version put forth by Peter Milligan was far stranger than anything that I had seen before in a comic book. The story-telling felt like what I thought Jack Kerouac would do in four colors, twenty-four pages each month- with monsters and something called an M-Vest. reading a new issue every four or five weeks for a year or two. Then it all became too much. Living my own life and remembering someone else’s mad traipse across America was simply too difficult. Yet, I really liked the art and the story- I wanted to know what was going to happen to them. So I did exactly what had to be done before comics were collected in reprints: I bought them each month and started a pile. I think the unread pile even moved once, perhaps twice. Finally, the day arrived when I sat down and read- probably for a week or more. We are talking about forty or more issues. I had liked the series initially. Even so, I was blown away by its ability to comment on modern life. It synthesized current issues with longstanding arguments and then pushing all of it through a manifestation of madness until something resembling sanity took its place. The real miracle was the way the characters came alive. Through a variety of transformations, they never lost their individuality that made them matter to the reader. Essentially, this was the peregrinations of Chesterton and Kerouac and Swift and Voltaire rewritten for the modern era in a format that took shape only recently. I still wonder that it worked so well before comics started being writ large, but I’m glad it did. You’ve Got to Check This Out is a blog series about music, words, and all sorts of artistic matters. It started with an explanation. 132 more to go. New additions to You’ve Got to Check This Out release regularly. Also, free humor, short works, and poetry post irregularly. Receive notifications on Facebook by friending or following Craig.